A typical day at The RGS, Guildford in Qatar begins with the pupils arriving between 7.15 am and 7.45 am. Our Pre-Prep children (Nursery and Reception) should be escorted to their classroom by their parents or carer and will be greeted by the classroom staff on duty. 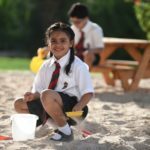 Once school bags and lunchboxes are stored in personal cupboards, the children may go outside to play, under the careful supervision of our duty staff. From Year 1 onwards pupils may be dropped off and can make their own way to their classroom in the morning. At 7.45 am the school bell will ring and all Pre-Prep and Prep children will line up to be escorted to their classroom by their class teacher. Senior School pupils are responsible for arriving at their tutor group room promptly for registration at this time. It is essential that every pupil is in school no later than 7.45 am and we are very strict on good timekeeping. Registration is from 7.45am to 7.55am and then morning lessons commence with three lessons before snack and playtime at 9.40am. Mid-morning lessons resume at 10.10 am, with a further two subject lessons before lunchtime and play from 11.20am –12.10pm. In the afternoon we have two subject lessons, followed by tutor time, with pupils finishing their studies for the day at 1.45pm. The school day for pupils in Nursery finishes at 1pm, however, pupils can remain in school until 1.45pm when the rest of the School finishes. All pupils from Reception onwards may take part in a wide range of after-school activities until 3pm while Nursery pupils are offered a crèche until 3pm.